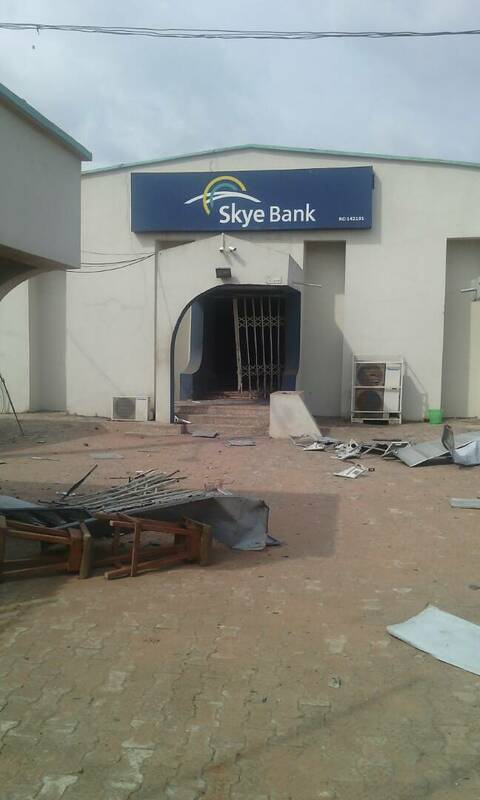 Armed robbers have attacked the Sky Bank branch in Ifon at the Ose Local Government Area of Ondo state, Sahara Reporters just learned. The robbers numbering over twenty were said to have moved into some strategic locations when they entered the town. According to Sahara Reporters, the robbers killed at least two policemen who wore mufti and engaged them a gun duel. The policemen were said to have been attached to the Sky Bank upon request from the Ondo State Police Command. A yet to be identified man was also killed in the gun battle as the robbers forced their way out to the town in a way to escape. An eyewitness told our correspondent in a phone conversation that the robbers stormed the bank premises at exactly 3 pm on Thursday afternoon. The witness pleaded anonymity and also disclosed that the robbery operation had disrupted commercial activities in the community. "The bank (Sky Bank Plc) was almost randing off their transactions when the hoodlums stormed the premises." "Immediately they entered the premises, it was the sound of gunshots that rented the air." "They blew the bulletproof doors with dynamites and held everyone hostage for close to one hour that the operation lasted." "They ransacked all the rooms in the bank, and packed all the money with the ones inside the vault before escaping from the scene with gunshots everywhere". It was reliably gathered that the robbers entered the town with three vehicles with unknown plate numbers. Femi Joseph, the spokesperson of the Ondo State Police Command confirmed the robbery incident on the telephone. Mr. Joseph said the police officers in the bank engaged the robbers in a gun duel but were overpowered after few minutes. He revealed that no fewer than two of their officers (policemen) were killed in the robbery operation that lasted an hour. According to him, the Commissioner of Police in the state, Gbenga Adeyanju, has led top officers of the police brass to the scene of the robbery. "We lost two of our men attached to the bank who engaged the armed robbers in a gun duel as they came with some very sophisticated weapons." "The Police Commissioner has visited the scene of the robbery and I can tell you that we are currently on the trial of the robbers and shall arrest them soon."